Afghanistan's spy agency has confirmed that Taliban leader Mullah Akhtar Mansour has been killed, after the US targeted him in a drone strike. US Secretary of State John Kerry said Mansour had posed "a continuing, imminent threat to US personnel". The Afghan National Security Directorate (NDS) said on Sunday that Mansour had been killed in the Dalbandi area of Balochistan province - the first official confirmation of the killing of the Taliban leader. Pakistan's government said on Sunday the drone strike was a violation of its sovereignty. It said the strike had "probably" killed Mansour and an armed male combatant travelling with him. There have been conflicting reports from the Taliban. 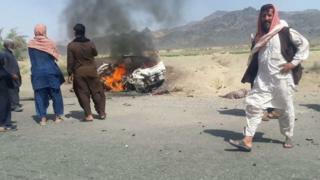 Senior commander Mullah Abdul Rauf told Associated Press that Mansour had been killed, but that the strike happened late on Friday. Other reports denied his death. One unnamed Taliban commander told Reuters: "We heard about these baseless reports, but this not first time. Just wanted to share with you my own information that Mullah Mansour has not been killed." The death of Mullah Mansour would be a big blow for the Taliban. He was gradually tightening his grip on the movement by bringing into his fold other leading Taliban members, including a son and a brother of his predecessor Mullah Mohammed Omar, and by launching large scale attacks on Afghan security forces. Under his leadership, the Taliban managed to capture an important city last year for the first time in 15 years. Mansour also managed to silence the splinter Taliban group under Mullah Muhammad Rasool, which challenged his leadership, and is credited by his followers for containing so-called Islamic State in Taliban areas. A vacuum created by his death would once again trigger a leadership struggle. Mr Kerry, on a visit to Myanmar, said: "This action sends a clear message to the world that we will continue to stand with our Afghan partners as they work to build a more stable, united, secure and prosperous Afghanistan. "Peace is what we want. Mansour was a threat to that effort." A spokesman for Afghan President Ashraf Ghani said: "Our hope in the wake of the strike is for the Afghan-led peace process to bring lasting peace and stability." Mr Abdullah said Mansour had been "the main figure preventing the Taliban joining the peace process".